Persian Learner Part One, Part Two, Part Three, Part Four, Extra Assignments, DVD and Instructor's Guide can now be ordered from Amazon. Bookstore ordering & course adoptions, please check here. Audio files for Readings are gradually being uploaded. Please register your books once received in the mail and enter your order confirmation to get access to the book's audio & video materials. Instructors with a valid verifiable college email can access more resources, TOCs & sample units. Find the link to the Persian Learner's Dictionary in the main tabs. 1. 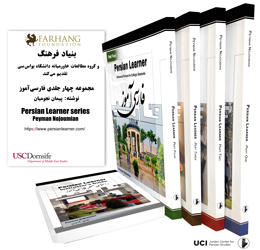 Persian language learners develop proficiency in Persian language and culture by introducing latest available resources. 2. Persian language teachers by educating them on the latest communicative and task-based language teaching approaches. 3. Persian native-speakers in diaspora sustain their language proficiency and culture.